Background: Peripheral intracath line is the typical hospital I.V line put in the hand or forearm when patients are admitted to the hospital intravenous catheters represent the most common parenteral for medication administration. Maintenance of the patency of these peripheral intracath lines is important for minimizing patients discomfort and the expense associated with replacement. Keeping this in view a quasi experimental study was undertaken on effectiveness of Heparin flush and Normal Saline flush for the maintenance of patency peripheral intracath line among the patients admitted to medical surgical wards of selected hospital. Materials and Methods: An experimental research approach with quasi experimental design with multiple measures was used for the study. Results: The study was carried out in medical and surgical wards of A J Hospital and Research Centre, Mangalore. The sample comprised of patients between the age group of 20-60 years. Samples were selected by purposive sampling technique. The Study findings revealed that in Group I (Experimental group) the mean patency scores of 72 hours (Post test 6) were 1.50 ± 0.51, 1.50, whereas mean scores of before intervention (pre test) was 1 ± 0, 1 respectively. In Group II (Control group) the mean patency scores of 72 hours (Post test 4) were 1.90 ± 0.55, 2, whereas mean patency scores of before intervention (pre test) was 1 ± 0, 1 respectively. It was found that there was no significant difference in patency sores of peripheral intracath line in Group I (F (5, 114) = 1.46, P < 0.05) and Group II (F (5, 114) = 2.10, P < 0.05) at different timings. This suggests that patency scores were same at different timings in both groups for 72 hours. There was no significant difference in patency scores of back flow, flow rate, resistance, infiltration, extravasation, and phlebitis between the Group I and Group II (t38 = 2.02, P < 0.05) at different timings. Thus it was inferred that patency of peripheral intracath line was maintained in the both Group I (Experimental group) and Group II (Control group) for 72 hours. Both heparin flush and normal saline flush were effective in the maintenance of patency of peripheral intracath line. Over 85% of patients admitted to hospital require a peripheral intravenous (IV) catheter in order to provide access for administration of drugs, fluids and parental nutrition. In addition, many critically ill patients require arterial catheterization for hemodynamic monitoring and blood sampling. Once the IV catheter is inserted its patency has to be maintained as long as possible. Maintenance of the patency of IV catheters in a peripheral vein is important for minimizing patient's discomfort and the expense associated with replacement. Infiltration, extravasation, phlebitis, and infection related to the catheter are complications associated with the use of peripheral IV catheters. Peripheral IV catheters are maintained by periodic flushing with a heparin saline solution. Different concentrations of heparin are used to maintain patency if peripheral IV catheter and to prevent clotting of blood without alteration of systemic clotting factors. Quasi-experimental, with multiple measures" was selected to assess the patency of peripheral intracath line after heparin flush and Normal saline flush every 12 hourly among the patients admitted to medical-surgical wards. The independent variables of the study are heparin flush and Normal Saline flush and the dependent variable is patency of peripheral intracath line. 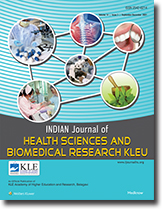 The study was conducted on 40 hospitalized subjects who have peripheral intracath line for 3 days in medical-surgical wards, at selected hospital, Mangalore. Purposive sampling technique was used to collect the data. The observation check list was used as an instrument for the data collection on patency of peripheral intracathline includes items such as back flow of blood, flow rate, resistance, infiltration, extravasation, and phlebitis. Infiltration and phlebitis are measured by infiltration scale and phlebitis scale. The data collection tool was submitted to six nursing experts from Department of Medical Surgical Nursing, two intensivists, and one statistian with the demographic proforma and observation check list to establish the content validity. The data obtained was tabulated and analyzed in terms of objectives of the study using descriptive and inferential statistics. Highest percentage (40%) of the patients in Group I was between the age group of 41-50 years, whereas in Group II, the highest percentage (30%) of patients was in the age group of 21-30 years. Majority of patients in the Group I (55%) and Group II (65%) were males. The highest percentage (40%) of patients weight in the Group I was between the 41 and 50 kg, whereas in Group II highest (35%) number of the patients weight was between the 51 and 60 kg. Majority of patients length of therapy in Group I (60%) and in Group II (65%) was >3 days, whereas the majority of the patients type of therapy in Group I (60%) and in Group II (70%) was medical. Majority of patients diagnosis in Group I (60%) and Group II (70%) was medical. Majority of patients diagnosis in Group I (60%) and Group II (70%) was medical. Majority (90%) of patients purpose of IV therapy in Groups I and II was IV fluids and medications. Maximum of patients temperature in Group I (45%) and Group II (50%) was 98.6°F. Highest percentage of patients pulse rate in Group I (45%) and Group II (60%) was 70-80/mt. Maximum percentage (45%) of patients respiration rate in Groups I and II was <20/mt, whereas patients blood pressure in Group I (50%) and Group II (40%) was 120/80 mmHg. Majority of patients cannula gauge in Group I (60%) and Group II (85%) was 20 and length of cannula was 1.26 inch, whereas majority (55%) of patient's site of cannula insertion in Groups I and II was dorsal. Majority of the patients in Group I (75%) and Group II (70%) were administered antibiotics, whereas 50% of patients frequency of flush/drug administered was 12 h. In the Groups I and II all the patients veins were not used previously for IV cannulation. In Group I, the mean scores of 72 h (posttest 6) were 1.50 ± 0.51, 1.50, whereas mean scores of before intervention (pretest) were 1 ± 0, 1, respectively. To find out the significance of difference in mean patency scores ANOVA is computed. The calculated F value of patency scores of peripheral intracath line in Group I was less than the tabled value (F (5,114) = 2.29, P < 0.05). This shows that there is no significant difference in patency sores of peripheral intracath line at different timings in Group I. Suggesting that patency level is same before and after several time after heparin flush. (F (5,114) = 2.29, P < 0.05). 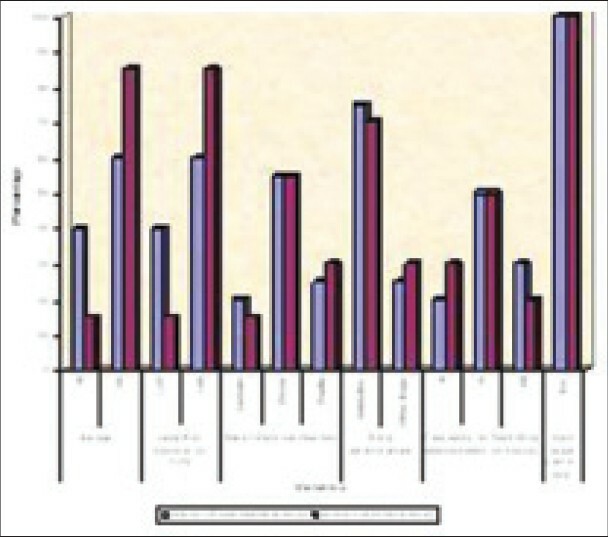 This shows that there is no significant difference in patency sores of peripheral intracath line at different timings, suggests that patency scores were same at different timings. 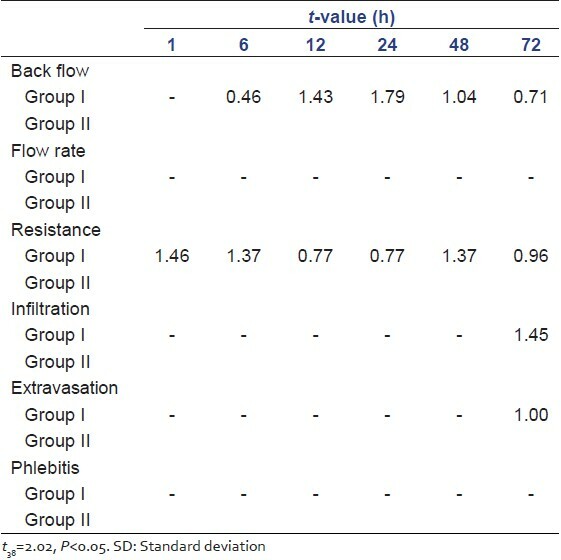 Data presented in [Table 1] shows that the calculated t-values of back flow at 1, 6, 12, 24, 48, and 72 h was 0, 0.46, 1.43, 1.79, 1.04, and 0.71; resistance was 1.46, 1.37, 0.77, 0.77, 1.37 and 0.96, respectively, whereas extravasation was one and infiltration was 1.45 at 72 h respectively. All the calculated t-values were less than the tabled value (t38 = 2.02, P < 0.05). This suggest that there is no significant difference in patency scores of back flow, flow rate, resistance, infiltration, extravasation, and phlebitis between the Groups I and II at different timings. The calculated t-values of 1, 6, 12, 24, 48, and 72 h of Groups I and II were less than tabled value (t38 = 2.02, P < 0.05) [Table 2]. To test the significant association between the patency of peripheral intracath line and demographic variables Chi-square test was computed to test the association. There was a significant association between purpose of therapy (χ2 (5.991) = 15.35, P < 0.05), gauge (χ2 (3.841) = 8.10, P < 0.05), length of cannula (χ2 (3.841) = 14.40, P < 0.05), site of cannula insertion (χ2 (5.991) = 9.05, P < 0.05), drug administered (χ2 (3.841) = 8.10, P < 0.05) and patency of peripheral intracath line. The results of the study showed that in Group I, maximum percentage (40%) of patients was between the age group of 41 and 50 years, in Group II 30% of patients were between the 21 and 30 years, and the majority of patients in Group I (55%) and Group II (65%) were males. The highest percentage (40%) of the patients weight in the Group I was between the 41 and 50 kg, whereas in Group II (35%) were between the 51 and 60 kg. Majority of the patients length of therapy in Group I (60%) and Group II (65%) was >3 days, whereas type of therapy and diagnosis in Group I (60%) and in Group II (70%) was medical. Majority (90%) of the patients purpose of therapy in Groups I and II was IV fluids and medications. Maximum percentage of the patients temperature in Group I (45%) and in Group II (50%) was 98.6°F. Highest percentage of patients pulse rate In Group I (45%) and Group II (60%) was 70-80/mt. Maximum percentage (45%) of patients respiration rate in Groups I and II was <20/mt, whereas patients blood pressure in Group I (50%) and Group II (40%) was 120/80 mmHg. Majority of patients cannula gauge in Group I (60%) and Group II (85%) was 20, and length of cannula was 1.26 inch, whereas majority (55%) of patients site of cannula insertion was dorsal. Majority of the patients in Group I (75%) and Group II (70%) were administered antibiotics, whereas 50% of patients frequency of flush/drug administered was 12 h, and in Groups I and II all the patients vein was not used previously for IV cannulation. In Group I the mean patency scores of 72 h (posttest 6) were 1.50 ± 0.51, 1.50, whereas mean scores of before intervention (pretest) was 1 ± 0, 1 respectively. And Group II the mean patency scores of 72 h (posttest 4) were 1.90 ± 0.55, 2, whereas mean payency scores of before intervention (pretest) was 1 ± 0, 1 respectively. It was found that there was no significant difference in patency sores of peripheral intracath line in Group I (F (5,114) = 1.46, P < 0.05) and Group II (F (5,114) = 2.10, P < 0.05) at different timings. 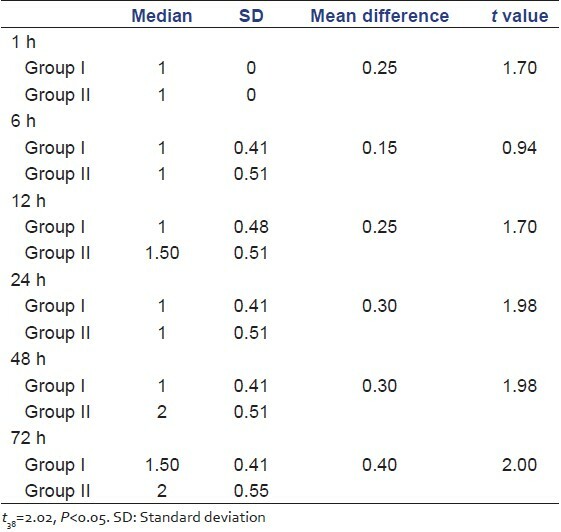 This suggests that patency scores were same at different timings in both groups for 72 h.
There was no significant difference in patency scores of back flow, flow rate, resistance, infiltration, extravasation, and phlebitis between the Groups I and II (t38 = 2.02, P < 0.05) at different timings. It was found that there was no significant difference in mean patency sores of peripheral intracath line of patients between the Groups I and II (t38 = 2.02, P < 0.05). The association of patency of peripheral intracath line with demographic variables showed that there was a significant association found between purpose of therapy, gauge, length of cannula, site of cannula insertion, and drug administered (P > 0.05). From the finding of the study it can be concluded that patency of peripheral intracath line was maintained in the both Group I (experimental group) and Group II (control group) for 72 h. Both heparin flush and normal saline flush were effective in the maintenance of patency of peripheral intracath line. 1. Shinozaki T, Deane RS, Mazuzan JE Jr, Hamel AJ, Hazelton D. Bacterial contamination of arterial lines. A prospective study. JAMA 1983;249:223-5. 2. McAllister CC, Lenaghan PA, Tosone NC. Changing from heparin to saline flush solutions: a research utilization model for implementation. J Emerg Nurs 1993;19:306-12. 3. Resources Corporation, 20 May 2005. Available from: http://www.thebody.com. 4. Theresa Finally. Intravenous therapy. Available from: http://www.books.google.co.in. 5. White SA. Peripheral intravenous therapy-related phlebitis rates in an adult population. J Intraven Nurs 2001;24:19-24. 6. Benvenuto DB, Guenter P. I.V Therapy Made Incredibly Easy. Springhouse Corporation; 1998. p. 88. 7. Niesen KM, Harris DY, Parkin LS, Henn LT. The effects of heparin versus normal saline for maintenance of peripheral intravenous locks in pregnant women. J Obstet Gynecol Neonatal Nurs 2003;32:503-8.